How would you answer the question, “Where is God?” Many would say, “God is in heaven,” or “God is in my heart,” or “God is in nature,” or “God is everywhere.” Those answers are certainly not wrong; and yet, they are not the best answers that we can give as Lutheran Christians. For a god who is just everywhere is a god who is really nowhere. A god who is merely everywhere is nowhere in particular for me. I’m no closer to him in one place than in another. OK, He’s everywhere, but how do I have access to Him? How do I see Him and hear Him and come into contact with Him? It’s like He’s always just two feet away but on the other side of a solid brick wall, and there are no doors to get through. We learn from passages like today’s Old Testament reading that our God is One who is not merely everywhere but one who puts Himself somewhere, in specific places for His people. He’s not just “out there,” above and beyond us; nor is He “in here,” coming to us from within ourselves. Rather, God has located Himself in particular, identifiable places for us and for our good. He’s not above locating Himself right where we’re at. In the Old Testament account, Jacob was on a last-minute trip out of the country. He took this trip for two reasons. First, he was running for his life. By deceiving his blind father Isaac into thinking he was the older son, Jacob had just stolen the family blessing from his brother Esau. You may recall how Jacob used the goat skin on his arms to accomplish the deception. Hairy-skinned Esau was furious about this and consoled himself by making plans to kill Jacob. However, while Jacob was fleeing from his brother’s anger, he used this opportunity to go to the land of his mother’s family and find a wife. For Jacob’s parents didn’t want him to marry one of the local pagan Canaanites. So Jacob was making this journey certainly with a mixture of emotions–both with fear for his life because of his brother, but also with some degree of anticipation because he was hopefully about to get married and establish his own household. Jacob is a lot like us, isn’t he. For the fact of the matter is that as we walk the journey of our lives, few of us have it all together, either. Rather, our lives are generally more like Jacob’s–a mixture of good things and bad. We move through life trying to make the best out of what we’re confronted with. In some ways we’re running from our past with a little bit of fear of what’s going to happen to us. In other ways we’re looking forward to the future with anticipation. Our lives, too, are usually a little more mixed up and complicated than we’d like them to be. And quite honestly, we, like Jacob, are often the cause of our own problems. Deception is an art that we also can practice. We too know how to put the goatskin on our arms, so to speak, to use manipulation and subtlety to make things go our way. But there are times when that subtlety backfires on us and things happen that we didn’t foresee. Our lives are often muddled because of the fact that, like Jacob, we are fallen human beings, unable to know God rightly or even take one step towards Him. A great canyon lies between us and God that we are incapable of crossing. However, to this far from perfect man named Jacob, in the middle of his mixed up life, God came in grace. During the night God gave Jacob a special vision in which he saw a ladder extending from heaven down to where he was. And please notice that this ladder wasn’t for climbing! The only ones on this ladder were angels ascending and descending. The whole point of the ladder is that God and God alone bridges the gap between Himself and sinners. He comes all the way to us, because we’re incapable of moving even one inch towards Him. God came down to Jacob and gave Him two wonderful promises. First of all, the Lord confirmed to him the same promise that was given to his grandfather Abraham and his father Isaac, namely, that all the earth would be blessed through him and his seed. And we know that God kept that promise. For Jacob’s other name was Israel, and out of the descendants of Israel came Him who is the promised Seed, our Lord Jesus, the Messiah. Through Him all the world is indeed blessed. And in the meantime, God made a second promise to Jacob–to be with him wherever he went, to protect him, and to bring him safely back home. The Lord said, “I will not leave you.” God broke into Jacob’s world, then, also for the purpose of comforting him and putting his mind at ease–not because Jacob deserved it, but because of God’s awesome mercy in using even ordinary fallen people like him to carry out His plan of rescuing mankind from sin and its grave consequences. The good news for us is this: God has also broken into our world in a decisive way for our good, just as He did for Jacob. Listen to John chapter 1 where Jesus spoke about Himself: “Truly, truly, I say to you, you shall see the heavens opened and the angels of God ascending and descending on the Son of Man.” Jesus purposefully used the very imagery of this Old Testament reading to describe Himself and His mission. Jacob’s ladder is a prophecy of Christ. For Christ is the true ladder between heaven and earth. He is the One who has bridged the gap between God and us. He is the One who, being true God, came down right to where we're at and took on our human flesh in order to rescue and comfort us. The omnipresent, everywhere God located Himself for us in Jesus Christ, the descendant of Jacob, so that we could know what God is like and so that we could hear and receive His saving promises. Jacob responded appropriately, in the way of faith, by receiving God's promises for what they were, and by worshiping Him there. Jacob understood what a wondrous thing God had done in stepping into the world in that place. And so He set up the stone which was at his head as a pillar, and he called that place "Bethel," which means, "House of God." For God wasn't just everywhere for Jacob. He was in that particular location for him. Jacob rightly said, "How awesome is this place! This is none other than the house of God, and this is the gate of heaven!" Just as was the case with Jacob, God has given us promises which calm our fears and ease our minds, even right now in the middle of our mixed-up lives. God has said that He will continue, even today, to put Himself in particular places for us, to help and comfort and guide us. The words that God spoke to Jacob He speaks to us at the holy font, "I am with you and will keep you wherever you go . . . I will not leave you until I have done what I have spoken to you." The Lord is there for you in and through holy baptism. For when He commanded it, Jesus said, "I am with you always, even to the close of the age." "I have called you by name; you are mine." The God of Abraham, Isaac, and Jacob is truly present in that water to choose people as His own, to create faith and forgive sins. Whenever a pastor baptizes someone according to Christ's mandate, you can say with certainty, "God is there; right there." The Lord is also truly present in His words. The Scriptures aren't just some nice history book with a few teachings about morality. Rather, they are the living words of Christ through which the Holy Spirit brings us to repentance and grants us saving faith in Christ. Wherever God's Word is, wherever it is preached and taught rightly, you can say without a doubt, "God is there; I heard the voice of God today." And God is really present in the Sacrament of the Altar. Christ's very body and blood are there under the bread and wine. Through this Supper God reconfirms His promise of forgiveness and life and strengthens us to live as His own dearly loved people. 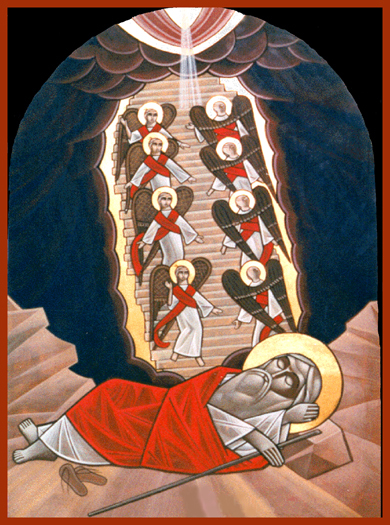 It was angels that ascended and descended on Jacob's ladder. So also, as we come into the Lord's very presence in communion, we join with angels and archangels and all the company of heaven to laud and magnify God's glorious name. As we gather around the Lord's altar, we can say the words of Jacob with complete assurance and boldness, "The Lord is in this place." Jacob said, "'Surely the Lord is in this place, and I did not know it.' And he was afraid." So it is that you are called today to believe with Jacob that the Lord is truly here and to have that due sense of fear and reverence that comes with being in the very presence of your Maker. As it is written, "The fear of the Lord is the beginning of wisdom." When God calls us to faith in Him, He calls us to believe not only in what Christ did long ago but also what He does among us still today.